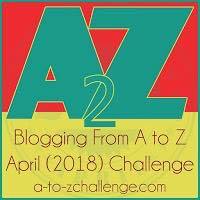 My fingers are itching to write and forcing my chronic fibroid pain to let them do what they love most for the #AtoZChallenge is here and I better do what I am best at. Well the pain isn’t bearable but I sure am penning this post because I can’t hold it any more. This is only the second time I am writing in March and it feels I haven’t breathed normally for a while now because writing is like breathing to me. The odds are just not in my favour and every moment I am enticed to give up on this coveted challenge and sit back and rest but giving up that easily is not me and that too something which has in last two years given me more than I could have asked for ~ my two books, The Fragrance of True Love and Dare to Defy the Destiny. With our shifting to a new abode coinciding with the challenge start date and with offspring at home whole of April for summer vacations, I will need a lot of your coveted push from you my precious clan....as I say always, I owe my everything to you. 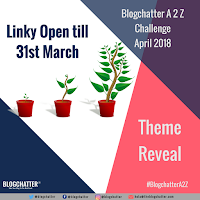 So my precious peeps, here I am officially announcing my participation in the Global #AtoZ Challenge for the third consecutive year and I am truly truly proud of it (I am attaching below a small video I did for Blogchatter on the same). Blogchatter is the most wonderful community I have come across in the last two years and I shall forever remain indebted to them for all the support they have rendered in thick and thin. A million notions are boggling me simultaneously as I pen this Theme Reveal Post for though I have a clear vision after doing two series for the last two Aprils, one non fiction and the other fiction and learning immensely, this year there are a various distractions from my goals. So finally, this time I wish to sail a different boat and the topic I choose this year is life itself. I call the series ‘Some extraordinary Slices of Ordinary Life’ in which I shall bring to some tickling and heart-warming and some thought-provoking anecdotes from life. While you may as well consider it a continuation to my most successful #FoodforThought Series on #TrulyYoursRoma, (probably because that’s what I am best at bringing some motivational and some conscience pricking True pieces to you), this A to Z posts shall be the same with a surprise twist you all are most welcome to experience from 1st April. There are umpteen facets of life which I always wanted to capture in my journal and I guess this is the right time and the right way to do it, to pour out buckets of my life experiences and learnings to a global audience and enrich from their experiences too in the process. Am Indebted To My Mom-Dad Forever!